Varies depending on the day of the week. 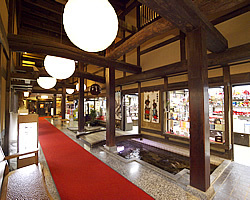 The shops offer a wide selection of tastes and handicrafts of Hida, as well as basic travel goods. Reminiscent of the streets of Old Hida, the “Hida-koji” is a walkway filled with unique souvenir shops. Quaint and picturesque, it includes a wooden bridge, trees and flowers, and lattice doors. 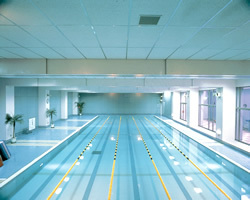 Young children especially love to watch the large “koi” carp swimming in the pond. The most popular souvenirs are 'Nama-kintsuba' (a type of confectionery) and 'Special Magnolia Miso', which are both original products of our hotel and only available from here. We also recommend 'Aka-kabura-asazuke', the delicious turnips served with your meals here, and 'Sarubobo' dolls which are made with a wish for happiness. 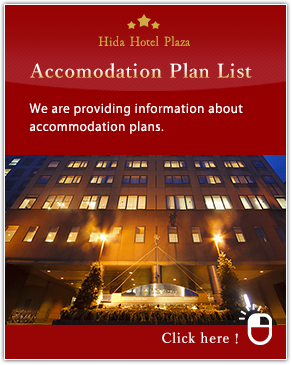 We have seven different types of large rooms, both Japanese-style with tatami mats and western style. 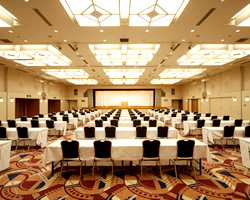 These include smaller conference rooms, suitable for presentations or receptions for a small number of guests, and the largest banquet hall in Takayama, which can easily accommodate up to 1,000 people.